Where Does the Bible Say We Should Pray to Dead Saints? Are saints who have physically died “dead saints” or are they alive with God? Leonard writes: I wrote this note after several days of frustration with people, on Facebook, saying that saints can’t do anything, because they are dead. They seem to be leaving out the fact that the souls live on. ENJOY! An antagonist named Warren Ritz asked, “Who are the “dead in Christ”, if not those who walked with our Lord, but who are now no longer among the living?” He is correct; the “dead in Christ” are those saints who have physically died. “For the Lord himself, with a word of command, with the voice of an archangel and with the trumpet of God, will come down from heaven, and the dead in Christ will rise first” (1 Thess 4:16). THE CONCEPT OF LIVING SAINTS CAN DO HARM TO THE “JESUS ALONE” DOCTRINE. From some people’s point of view, people who have died are classified as “dead saints,” who can do nothing. They are no longer a force to reckon with; they can no longer appear; they cannot talk nor do other things. These same people don’t want the saints who have died doing anything because this would be another reason why the Protestant doctrine, “JESUS ALONE” fails. If the so-called “dead saints” do anything then it is not “JESUS ALONE,” but Jesus and the saints cooperating. And it would also mean that the so-called “dead saints” are in fact not dead, but alive with God. HIS PHYSICAL BODY DIED BUT HIS SOUL LIVED ON. But, are the Saints who have gone before us alive with God or are they truly “dead saints” who can do nothing as some would suggest? Yes, their bodies are dead, but their souls live on. 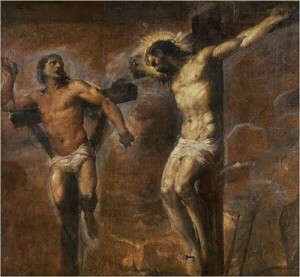 For example Jesus said to one of the criminals on the cross next to him, “Amen, I say to you, today you will be with me in Paradise” (Lk 23:43). Yes, that day, this man became the dead in Christ because his physical body died on his cross; however, Jesus said that today, this man would be with Him in paradise. He was no “dead saint” because his soul was alive in Christ in Paradise. 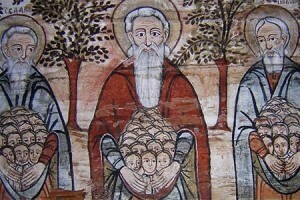 “God told him, ‘I am the God of Abraham, (the) God of Isaac, and (the) God of Jacob’? He is not God of the dead but of the living. You are greatly misled” (Mk 12: 26-27). WHEN MOSES AND ELIJAH APPEARED WERE THEY DEAD OR ALIVE? There are those who insist that saints who have died are nothing more than “dead saints” who can do nothing. I usually ask them this question. 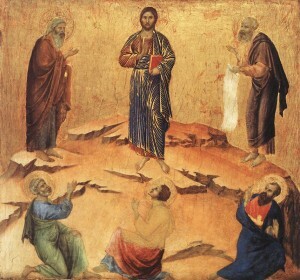 When Moses and Elijah appeared with Jesus on the Mount of Transfiguration, were they dead or alive? 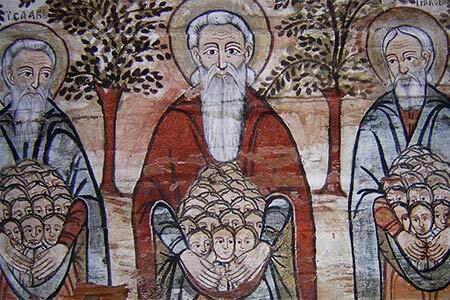 “And behold, two men were conversing with him, Moses and Elijah” (Lk 9:30). Not bad for a couple of so-called “dead saints;” not only did they appear, but they were talking as well. The question that I asked usually goes unanswered. SORRY LEONARD…YOU HAVE A BAD ARGUMENT. Bill says, “As Ecclesiastes says the dead have nothing more to do under the sun…sorry Leonard…you have a bad argument.” He is using this as definitive Biblical proof that people on the other side cannot do anything once they have died. After all, Ecclesiastes does say, “For them, love and hatred and rivalry have long since perished. 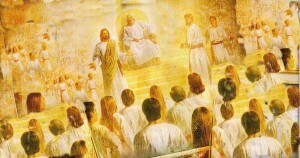 They [the dead] will never again have part in anything that is done under the sun” (Eccles 9:6). When a person dies their body is in the grave; it is dead. They can no longer work under the sun, in this world. However, Ecclesiastes 9:6 is not a prohibition against the activity of the person’s soul, which lives on. This of course begs the question; is there any indication of personal activity of a soul after death, in Scripture? Yes, there are a number of examples and here is one of them. Elisha after dying performed marvelous deeds. In life he [Elisha] performed wonders, and after death, marvelous deeds (Sir 48:14). “Elisha died and was buried. At the time, bands of Moabites used to raid the land each year. Once some people were burying a man, when suddenly they spied such a raiding band. 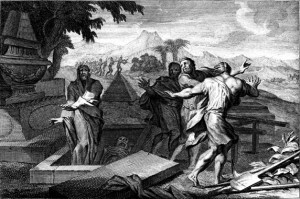 So they cast the dead man into the grave of Elisha, and everyone went off. But when the man came in contact with the bones of Elisha, he came back to life and rose to his feet” (Kings 13:20-21). Using, Ecclesiastes 9:6 as a prohibition against all soul activity after death is to use the verse out of context and at odds with other parts of the Bible. Ecclesiastes 9:6 is referring to the physical body that has died, not the soul that lives on. 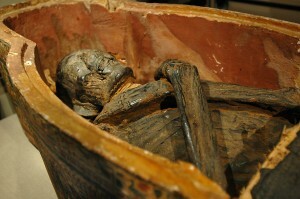 Elisha, after death performed marvelous deeds. It can’t be much clearer than that! JESUS NEVER CLAIMED THAT THOSE WHO HAVE DIED ARE “DEAD SAINTS.” Jesus understood well that when someone dies, they will live and in fact those who live and believe in him WILL NEVER DIE. “Jesus told her, “I am the resurrection and the life; whoever believes in me, even if he dies, will live, and everyone who lives and believes in me will never die. Do you believe this” (Jn 11:23-26)? This union, with the saints on this side and the saints on the other side is referred to as the communion of saints in the Apostles Creed. Those who insist that “dead saints” can’t do anything because their bodies have physically died seem not to understand that their souls live on and are very involved. So, where does the Bible say we should pray to dead saints? I would ask, Where does the Bible say saints are dead?